Enhancing Your Image: Group photo for an ad. Group photo for an ad. 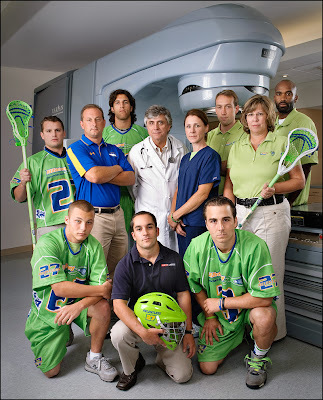 This was created for an ad for a foundation with ties to lacrosse that raises awareness and funds for cancer research. We were granted brief access to a radiology room in a hospital. The mood was to be that of a team of people united in the quest to beat cancer. The lighting was set up, the people arranged and images taken during a period of about 15 minutes. When working with a group of people who aren't models it's imperative to work quickly so no one gets impatient and annoyed. In cases like this I rely on experience and intuition to know how and where to set the lights and arrange my subjects. The last five minutes were spent shooting about 30 images. It's also very important to control the mood and thinking of all of the members of the group so that their attention and mood is "focused" in the way that is appropriate for the intended message. I do this by getting the group in the proper frame of mind and instructing them what I want them to think. Their thoughts project outward naturally through their body language and the camera is capable of capturing this. A low camera angle and a very wide angle lens was chosen to make the group look more heroic and make the image more visually interesting. Three lights were used in addition to the ambient lighting.